Can a twisted ankle break a bone in my foot? When you twist and sprain our ankle, we tend to focus on the damage to the ankle itself, such as torn ligaments. A twisted ankle can also seriously fracture a bone in your foot. A strong tendon travels down the outside of the ankle and connects to the fifth metatarsal bone. A sprained ankle can create sudden tension on this tendon and cause your bone to break. 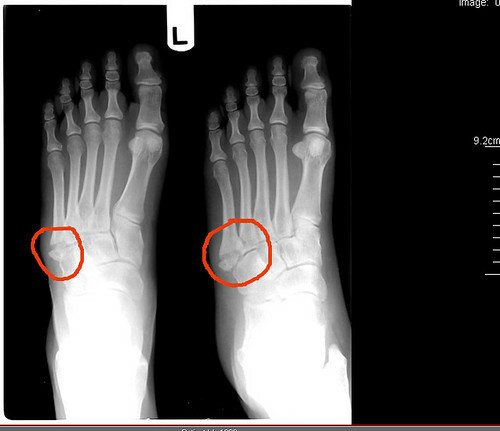 This is commonly known as a Jones fracture. A Jones fracture can be quite serious and difficult to heal. Because it is formed by the pulling of the tendon, it is commonly displaced. In these cases, surgery may be necessary to repair the bone and return it to full strength and function. If there is no displacement, immobilization of a Jones fracture is very important. Even if you immobilize it quickly, surgery may still ultimately be needed if it doesn't completely heal. The only way to know what treatment is necessary is to visit with Houston podiatrist Dr. Andrew Schneider immediately after an injury. Many people who read this also wondered Can You Use Biofreeze for Neuropathy?